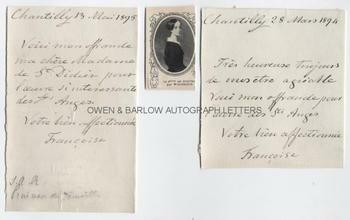 PRINCESS FRANCOISE OF ORLEANS Two autograph Letters Signed. Princess of the French royal House of Orleans and Duchess of Chartres. Two ALsS. 2pp. Chantilly. 28th March 1894 and 13th May 1895. To Madame de St. Didier. Together with a contemporary small newsprint portrait. Text in French. Both letters refer to her offering or contribution towards the work of St. Anges, which was presumably a religious order involved in philanthropic work. 12mo and 16mo. Approx 6 x 4 inches and 4.75 x 4.5 inches. Lacking integral blank leaves and with mounting traces to blank versos. Very good. Princess Francoise of Orleans was the daughter of Prince Francoise and Princess Francisca of Brazil. She was the granddaughter of King Louis Philippe I of France.